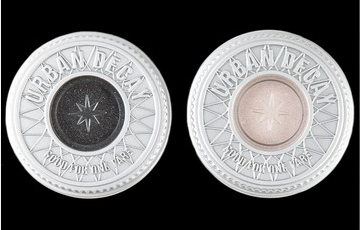 Professionals, celebrities, and makeup junkies swoon for the wide array of shades from Urban Decay. Each one is loaded with color and contains very few binders (the stuff that holds shadow together), resulting in beautiful color that blends easily and lasts. I hate the pink color is completed washed out in these pictures. The shadows look and apply MUCH better on the lids than hands (not sure why...) Grind is a great color and alternative to put in the inner corners as highlight. Both are very buildable and long lasting! 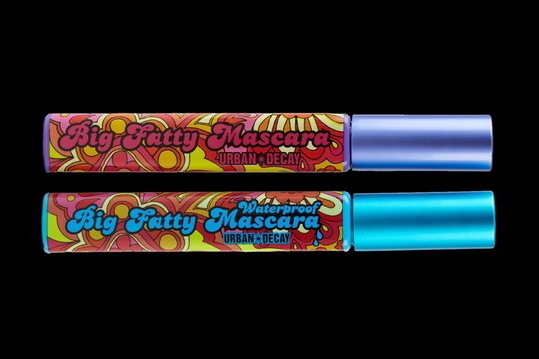 Urban Decay's Big Fatty Mascaras create the fullest, fattest lashes imaginable. The creamy formula glosses on with a big fuzzy wand to separate, thicken and lengthen lashes. In fact, after two coats, they might be mistaken for falsies. They are just OH SO big. Hands down they aren't meant for people who have small eyes like me. The fiber and coat are way too heavy for my Asian lashes. They do not lengthen or volumize my lashes at all. So disappointing! Good Karma Brush is made with super soft synthetic Taklon, a man-made fiber that comes to a fine point at the tip, just like a natural hair. Urban Decay crimps and manipulates these high-tech two-tone fibers just perfectly for what it was built to do. The weighted, brushed metal handles have an exclusive knurling for a better grip for easy application, plus their sleek look is so chic. I did a slight comparison in the video on the Urban Decay Wonder Brush, ELF Eyeliner Brush and the Bobbi Brown Ultra Fine Eyeliner Brush. The winner is Wonder Brush. It's flat and wide, yet point for me to apply liner really quickly. The quality of both the handle and hair is amazing even after many washes. I will definitely repurchase even with regular price. Have you tried anything from Urban Decay? How do you like them?